The Nile crocodile (Crocodylus niloticus) is the largest of the four crocodile species found in Africa. They have a long tail and powerful jaws. Their back feet are webbed for swimming. They can grow up to 20 ft (6.1 m) in length and can weigh up to 1,500 lb (680 kg). The males are usually bigger than the females. Nile crocodiles are also found in Madagascar, sub-Saharan Africa and the Nile Delta. They were also found in Jordan and Israel before. They live in different habitats including lakes, rivers, estuaries, freshwater marshes, and mangrove swamps. The Nile Crocodile is carnivorous, or eats meat. The Nile crocodile eats bigger animals as it gets bigger. Young crocodiles will eat insects and small fish, while adult crocodiles can catch and eat zebras, antelopes, wildebeests and buffalo. The Nile Crocodile will attack anything, even other crocodiles. 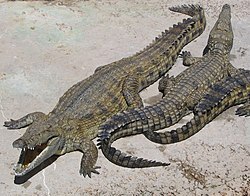 The crocodiles mate in the water, and then the female lays her eggs in a hole dug in the ground. They can lay 60 eggs which take about 90 days to hatch. One unique thing about the Nile crocodile is that the female will guard the eggs until they hatch. Young crocodiles are able to reproduce when they get to about 12 years old. ↑ 1.0 1.1 1.2 1.3 "Nile Crocodile". Nile Crocodile - National Geographic. National Geographic. January 14, 2016. Retrieved January 14, 2016. ↑ 2.0 2.1 2.2 2.3 "Nile crocodile - Crocodylus niloticus". arkive.org. 2012. Retrieved 19 November 2012. This page was last changed on 11 March 2018, at 12:23.